Many audiophiles believe that it’s impossible to find a bookshelf speaker capable of delivering impactful sounds under 100 bucks, but Micca proves them wrong with the MB42X. Now, manufacturing quality budget bookshelf speakers is not new to Micca, but the MB42X proves that quality can be affordable, with a beautiful design and excellent performance, making it one of the best bookshelf speakers that you can get for your dorm room or man cave. Keep reading if you want to know our take on these speakers. You won’t be disappointed. The MB42X bookshelf speaker from Micca inherits the looks of its predecessor, the MB42s model, with a simple ebony laminated wood grain design that allows it to blend into any room or décor. Each of the units features a four-Inch woven carbon fiber woofer with rubber surround along with a silk dome tweeter. The design is a bit plain, to be honest, but that’s expected since it’s a budget speaker. The MB42X cabinets are somehow bulky for bookshelf speakers, with 6 in width, 7 inches in depth, and 10 inches in height, but they’re light and portable, which makes up for the dimensions. What’s impressive about the Micca MB42X bookshelf speakers is the big picture they project. Try closing your eyes while listening to the beats coming out from these audio devices, and you’ll mistake them for a bigger set. The crossover that the folks at Micca added to the MB42X, which is the biggest upgrade over the MB42s model, allows for bright and punchy highs with a sound that’s evenly dispersed across the room. Improved soundstage? Check. Enhanced imaging? Check. Clear sounds? Check, check, and check! The bass from the MB42X bookshelf speaker isn’t bone rattling for sure, but that’s just normal considering the relatively compact size and the price. If you’re looking for home-theater speakers, you’ll need to use a subwoofer alongside the MB42X. Nevertheless, thanks to the drivers, which are the same used in the poplar MB42 model, the bass is good despite the small size of these speakers. The mid area is where these speakers really shine, with an unbeatable clarity in this price range. You can confidently use these speakers on their own or as front and rear surround speakers on a 5.1 home theater system, and you’ll be impressed by the quality either way. If you’re looking for a speaker that covers the full spectrum of sound, including treble, midrange, low-midrange, mid-bass, and bass, these Micca boys are what you need. If you’ve ever owned a Micca speaker before, you’ve probably noticed how well they perform when watching movies for both vocals and soundtracks. Well, the MB42X model offers an even better experience thanks to the included crossover. For movie buffs on a budget, these bookshelf speakers are a no-brainer. Do you know what the French say? They say; “La simplicité fait la beauté,” which literally translates to “simplicity makes beauty.” Micca follows that principle, as they deliver the MB42X bookshelf speakers in a well-protected package that contains the main units along with a user manual and the necessary wires. Short and sweet. The Micca MB42X Bookshelf Speakers won’t give you the high-tech appearance that screams “expensive,” but what they can offer is clear sound and captivating beats in both the midrange and high areas along with decent bass on the low-end. All of that without blowing a hole in your wallet. If that’s what you seek, these bookshelf speakers won’t disappoint. Of course, there are far better products, but they come at far higher prices, making the Micca MB42 a must-have for those on a budget. 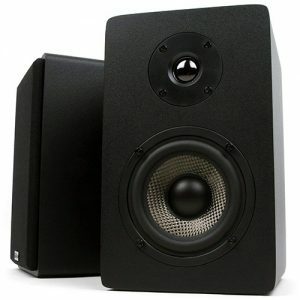 At time of review, the Micca MB42X featured in our “Best Bookshelf Speakers Under $100” category. Please check above for latest price and user reviews.